Note 1: There are only so many places in the wide world that offer an approachable scene of mountains along with gorgeous coastline in the same incredible hikes. Some examples include exotic places like Santa Barbara/California, Monaco/France, or Whakatane/New Zealand. These epic places all carry that rare majesty of mountain-range combined with coastal experience. These areas, at minimum, are straight-up wonderlands. It pulls on our imaginations and taps our curiosity to even glimpse images of these places. There is yet another place though, no less profound, further up the northern hemisphere, that is so worthy of your attention. For the lucky trailblazers who have stood at the peak of Mount Errigal in County Donegal, Ireland, and turned their gaze North (Image/Below), it becomes scintillatingly clear that this is one of the most incredible mountainous/coastal regions on Earth. 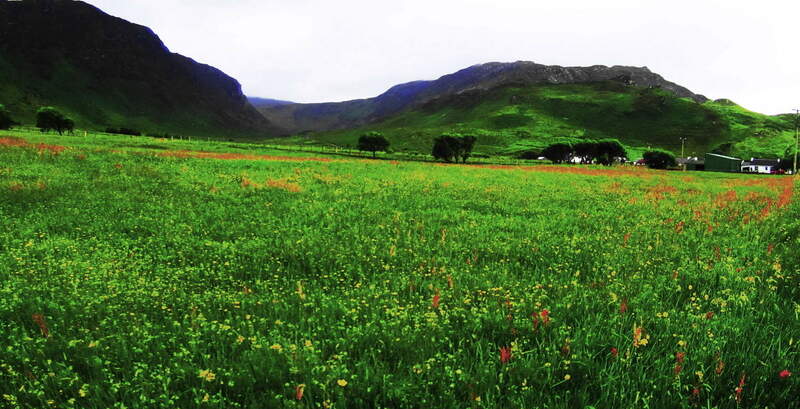 This is Donegal, Ireland. If you haven’t found your way there yet, then this is your chance to get a glimpse of this ancient place. Sometimes just a glimpse is all it takes to get you there, like falling in love at a glance. 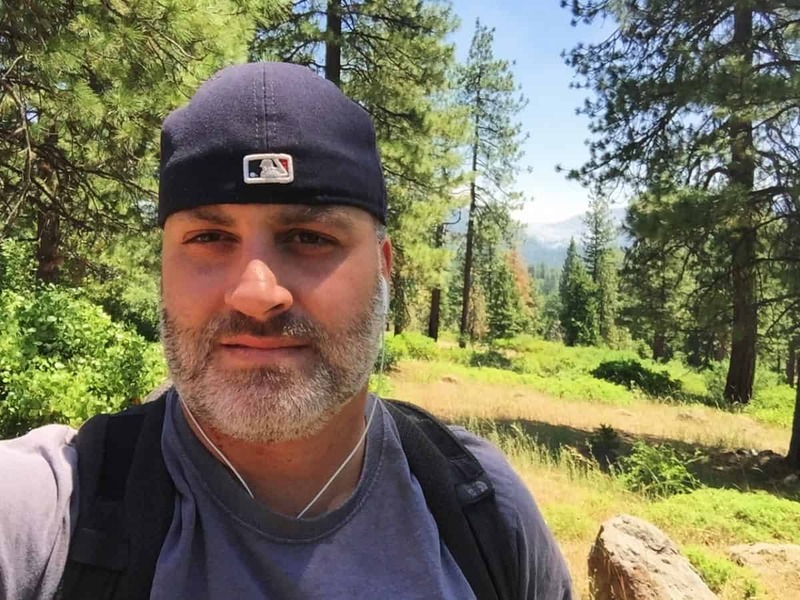 This is the overall goal of Stonestrider.com; not just to show you how beautiful a given place might be, but to give you enough visual substance to put you over the top, and get you to make the decision to get there… in real-time. The Region: Before entering the dimension that is Donegal, the logistic mystery that surrounds the area should definitely be addressed. Even describing the cartagraphical affiliations of the area creates a bit of a tongue-twister; colors can be used to describe the political designation of Donegal. Donegal is in the physical region of northern Ireland, and more specifically northwestern Ireland, and remains part of the nation of Ireland, which generally continues geographically South from Donegal. Donegal, however, is not in “the nation” of Northern Ireland, which is part of the U.K. The north-eastern part of the island is the U.K. Be aware of this national distinction if you travel anywhere due-north of Dublin, the proud people of this specified region most certainly are. Note 2: The history of the northerly destinations of Ireland should definitely be looked at for a moment before thinking of traveling through. Deadly conflict has taken place around the area of Belfast due to the occupation of British forces. This controversial occupation extends far back in Time, even before Colonial times, into the Medieval period. Interaction between the British, Scottish, and Norse cultures, are interwoven into the overall ancient history of the region, with the British prevailing into this Modern period. 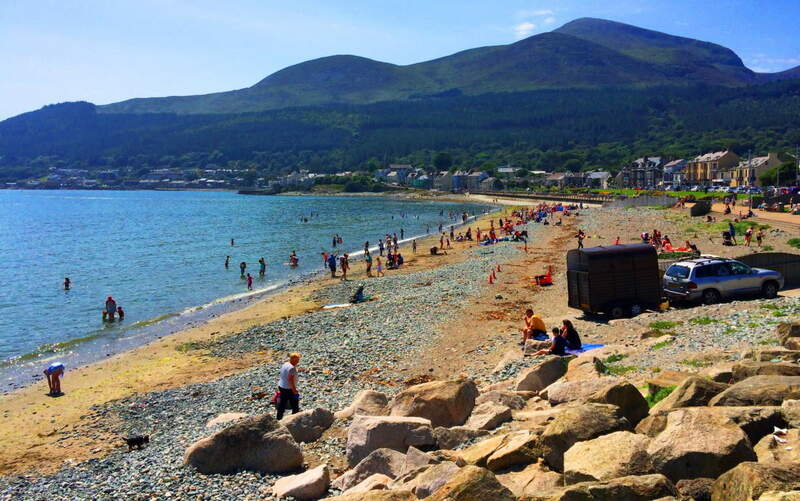 Towns like Newcastle in the Mourne Mountain Range have a proud tradition of being part of the U.K, with hundreds of British flags often displayed in the old-town center, nestled into its beautiful coastal/mountain scene. (Image/Left) Travelers should know that there is no toll, or wall, separating the northeastern region from the rest of Ireland. The beautiful Irish landscape rolls through the entire Island unhindered, and you can pass from county to county freely, regardless of these modern distinctions. Note 3: A seekers approach to Donegal can definitely start with the Megaliths, among many other beautiful things from era’s past. The ancient monuments of Ireland, its Dolmens, Cairns, Standing Stones, Stone Temples, and Castles, are extremely important for trail-finders. Their initial quality of lending the deepest spiritual significance to the landscape is only the beginning of their impact; they also give hikers something significant to strive for, a goal beyond the typical tourist attractions i.e: places where the locals stare distantly from beyond the parking-lots. 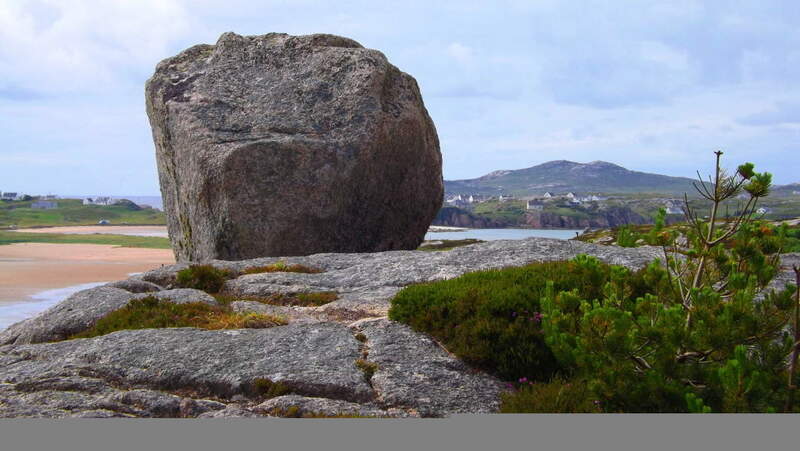 Often times, if you set your sights on a sacred site, those beautiful and impossible stones in the illusive distance, wonderful and unpredictable things will appear and happen along the way. An example of this is found on the wonderful trail high above Glenveagh Castle, in Glenveagh National Park. There is a totally unmarked Wedge Tomb in the most dramatic of places, right next to the elevated trail. Finding these relics is not only a natural rush, but it also supports the idea that someone lived in this specific area as far back as the Neolithic Period, and if you explore further, it is likely that you will find more magical anthropological statements, adding to the wonder and mystery of the scene. This Wedge Tomb had that special symmetry that so many Megaliths do (Image/Below)… it is placed in the absolute center of the gully, and above an incredibly beautiful Glenveagh Lake. The view just 20 yards away from the Wedge Tomb, is truly spectacular with the Castle in the Frame. It is no wonder that an ancient group/culture found this spot to be a place worth living in, and claimed it with territorial stone statements. Incredible. 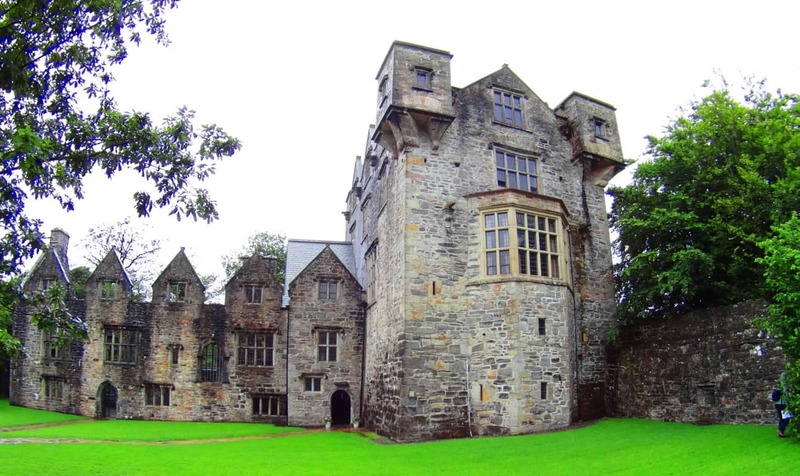 Other times, you can often be hiking and just around the next bend an incredible historic site will just appear practically out of nowhere, as Monea Castle did for me while hiking a roadside in Enniskillen on my way to Donegal. Walking towards a countryside castle like Monea is like wandering into a dream; often without another person for miles, with only the quiet stillness to picture the beautiful life-style that had taken place here hundreds of years ago. (Image/Above) Not far from this very same scene, continuing north on the A35 to enter Donegal from the South, you will discover the approach for Drumskinny Stone Circle. There is countryside for 15 miles in every direction when you arrive. The stillness is shocking. 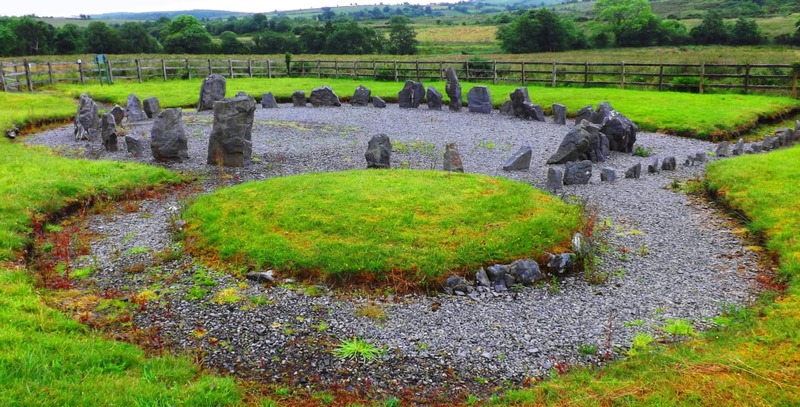 This is the epitome of Stones Circles in Ireland. Drumskinny is in a classic radial form, along with a linear extension of smaller stones, which are certainly worthy of a study beyond the scope of this article. Perhaps there is a celestial connection? Each stone is beautifully unique, like people, and yet the unify into one shape. These places of ancient ceremony have a vibe similar to that of visiting a relative over the landmark age of 100, that is: without words there is an amazing depth to the moment, however still and nearly silent the scene may be. These are the places where the Celts had dwelt for centuries; generations of everyday farmers, householders, and small-business-owners are their descendants. They have survived countless struggles to remain connected to their homesteads. After visiting this beautiful place at the southern edge of Donegal, you will be ready to move North to a region where two Dolmens have stood since the beginning of History. 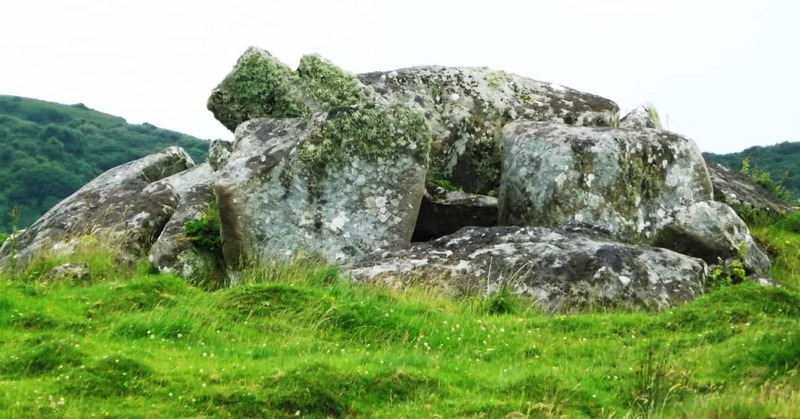 Both the Gortnavern Dolmen, and the Kilclooney Dolmen, are located in County Donegal, and are fantastic options for a multifaceted adventures with a climactic focus. Now let’s wander in an entirely different direction. The Kilclooney Dolmen Excursion: Mount Errigal could be considered the epicenter of County Donegal. It helps to describe the many features of Donegal in reference to its beautiful white peak. The countryside to the East, which heads toward the Gortnavern Dolmen, is an inland scene of enchanted mountains and rolling valleys. The countryside to the South, which leads toward the Kilclooney Dolmen, is a different experience entirely, a coastal scene of cliffs, crescent beaches, rocky caverns, and an amazingly iconographic waterfall. From Errigal head South along the N56 to the R261. 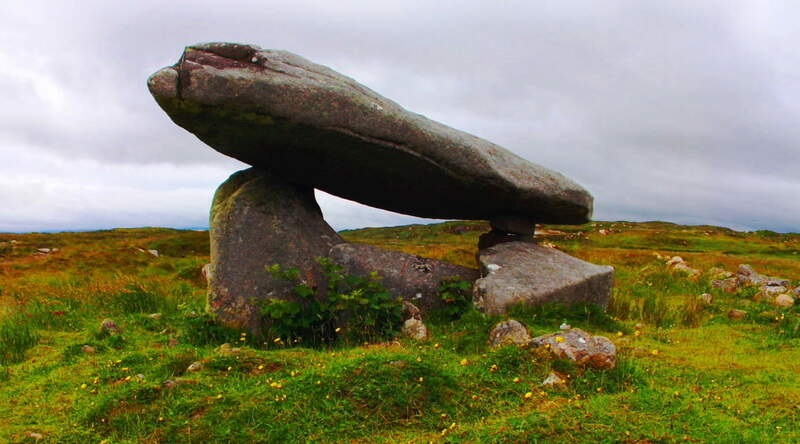 The R261 will take you to the Kilclooney Dolmen Centre, where you can take the short hike to the Dolmen. Not far from the Centre, at the farm house just up the road on R261, is an almost hidden, practically forgotten set of stones that was once a beautiful Wedge Tomb. It is unmarked by the side of the road, and clearly, once upon a time, a capstone was balanced above the supporting stones. Amazing. It is just an indicator that there are sacred things, seen, and unseen, all around you here. The entire landscape is a type of natural “temple”, a once synergized region accentuated by stone fixtures that we are still trying to understand in these late Modern times. Before you start hiking here, wear ‘tall boots’! Having the right boots is the difference between a challenging experience, or something challengingly wonderful. As is the case with so many indigenous ancient sites, there is not a ‘standard path’ to the Megalith, you simply have to see the Dolmen about 150 yards behind the farmhouse and make your way towards it. For those who understand how wonderful this experience is, the non-commercial experience, the chance to laugh increases and releases with each and every Irish-as-hell step. These are truly special moments in a literally sacred Irish countryside. The terrain here is mossy, with brackish water mixed into tall-brush, and sandy dunes. Your ‘tall boots’ will make an easy walk through the terrain, right up to the ancient stone-lining which runs directly to the Dolmen and Wedge Tomb; they sit atop a small knoll covered with wildflowers and tough moss. Here is a prime example of how stones that look like a “wall” leading up to the Dolmen and Wedge Tomb, are certainly not a wall. These stones are a “Lining”; a veritable cable made of stones, which connects sacred site to sacred site, just like in New England. These stones were never, by definition, a “wall”. The stones of the Lining’ couldn’t stop a single thing passing through this country side, and it was never meant to. The Lining’ is part of an over all scene, all of the same Period, and most likely created by the same individual(s) as an “energy center” for the over-all scene. With the Atlantic Ocean only a mile or so beyond, the air here is medicinally salty. This “beach-day breeze” inundates everything, from the moss and grass, to the Dolmen’s very stones. This is an above average size Dolmen, with a massive “satellite-dish-like” 20 ton Capstone. This Capstone is balanced, and set roughly 5 feet above the ground. There is a slightly dilapidated Wedge Tomb with a 5 ton Cap-stone just ten yards away. This Wedge Tomb is no less priceless or significant in an archaeological sense, and certainly beautiful in its own right. Again, like Gortnavern, Poulnabrone, and the dozen or so remaining in-situ Dolmens in Ireland, Kilclooney is roughly 4000 to 6000 years old, and a unique version of the classic Portal Tomb. This is a place to sit and contemplate the scope of Time, the magical possibilities implied by the Stones, and the luck of being alive to see them. Assaranca Waterfall: Like so many highways in other countries, certain roads simply become other roads, or have two names. 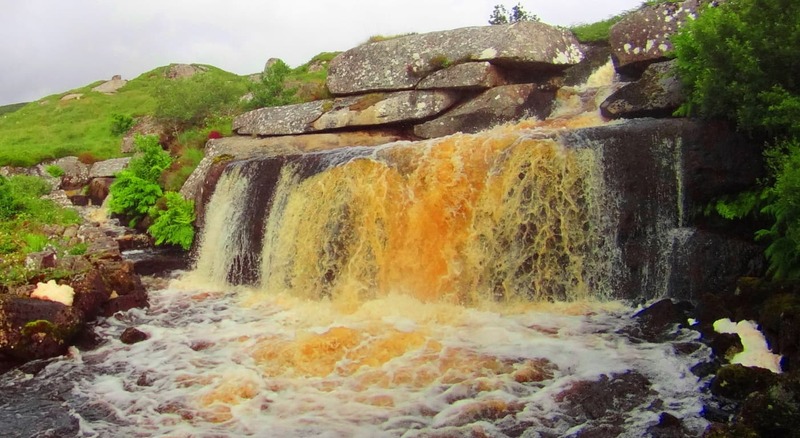 After taking in the experience of the Kilclooney Dolmen site, you should continue driving to see the beautiful Assaranca Waterfall on the R261 South, which simply becomes the N56. Not far passed “Northwest Sea Kayaking” business, along the N56, just passed a beautiful white house with a red door, is a road with no name. It is a right-turn road with signs that point and say: “Tra Strand”/Uaimh Caves/Eas’ Waterfall 6 km/: standing clearly for all to see. Take the Right onto this classic Irish road and enjoy the short drive to the beautiful Assaranca Waterfall. The roads here are the hiking trails. This gorgeous region is known as Lackaduff. You can park your car at the waterfall and begin a beautiful hike towards the massive caves within the beautifully looming cliffs, all about 2 miles further up the lane. Small mountains encompass this rugged bay-route pathway, with adorable homes and fields of wildflowers, along with flocks of sheep. These are working farmers and fisherman in the area; they are not on vacation, so please be kind to those you meet, whoever that may be. Soon you will arrive to the beach… When you arrive take the path into the sand-dunes just at the end of the lane, and head out to the beach toward the caves (on the left.) As other places have been described in Stonestrider.com, this place looks like the perfect Jedi hideaway, perhaps to be found only by the most devout of disciples. The colors here; the glassy Atlantic Ocean against the super-fine sand; the cliffs and caves under a cloud-sized blanket of green; they create a living canvas that just pours out an absolutely radiating beauty. Last Note: Donegal is both rugged and radiant in one. There are striking scenes of mountains that just cut the sky with white stone peaks; there are rolling green ranges of mountain after mountain, after mountain. Eventually these mountains slam into a crystalline Atlantic Ocean. 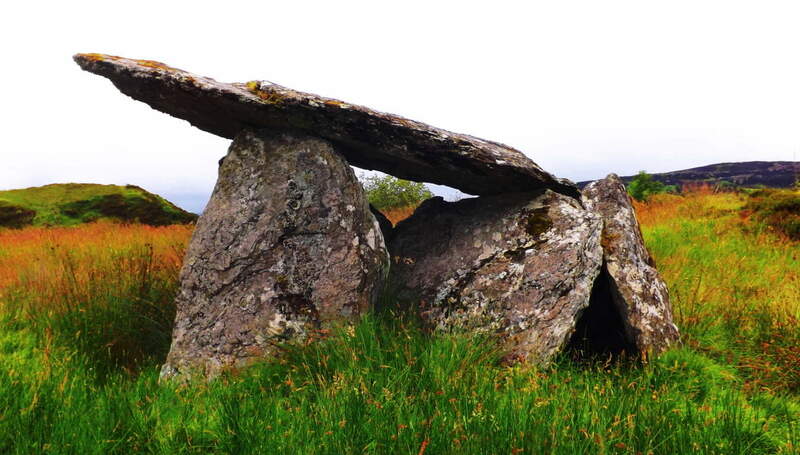 The Dolmens in Donegal indicate that the culture of the region is as old as Time itself. Wandering into this County is equivalent to wading into a Celtic Tsunami. The beauty is overwhelming. In every direction there is a pastoral dimension which is vividly painted in every possible variation of green. 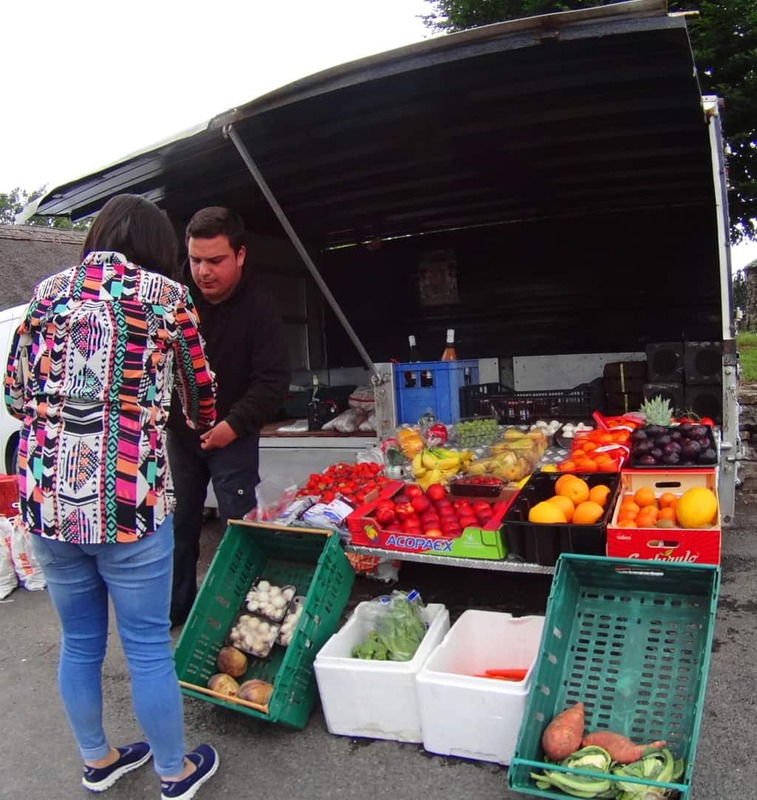 Donegal is so connected to the land, that the entire region is a ‘trail’. You don’t look for “the trail” at ‘Ranny’, the little dark mountain (Image/Below) which sits a valley away from the Gortnavern Dolmen; you simply climb the mountain. The mountain IS THE TRAIL. Donegal feels like the landscape that never told a lie. It is the last European coastline upon the vast Atlantic Ocean which cuts jagged jade cliffs into what was for centuries the edge of the known world. Come out and stand on the edge. Seek and Find.